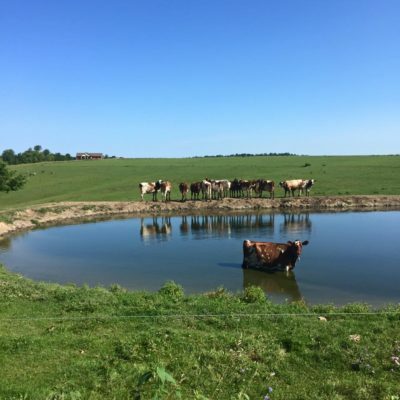 Farmer Danika blogs about a ton of things farm related such as: Growing up on a dairy farm, raising tobacco in Vernon County, vet needs, the importance of eating good food and my romantic cows stories…not at all kid appropriate. Check it out if you are over 18! Why wouldn’t my GPS find you? Our road name got changed from Spring Coulee Ridge Rd to Jore Rd years ago for the area dispatch. GPS systems are not always correct in the country. Please follow our maps and signs. Can we bring our dogs out? We rather have all dogs stay in the vehicles due to our dog Sam can be aggressive to other dogs or will try to breed your dog. We also had chickens killed and cattle chased with other dogs and we prefer that not happen too often or ever again. Can we just drop our kids off? No, this is a working dairy farm. Parents must be with children no matter what age at all times. Are your fences electric? Do you have a bull? Yes, a high powered beef fencer. It will keep cattle in if everything is working correctly. We do have a bull most times of the year, which if you stay on the correct side of the fence you are welcome to look at him, not touch or harass him. Why doesn’t your organic beef have an organic label on it? We like to butcher our beef locally and our local locker plants are not certified organic due to paperwork reasons. This saves both the customer and us money, and gives us a better product than shipping our animal hours away and bring frozen meat home from hours away. I don’t see pasture raised pigs and lots of free range chickens at your farm? Nathan’s brother raised most of our pasture raised pork & free range chickens we sell at his home in Mondovi, Wisconsin. Do you feed or use GMO, insecticides or herbicides? Our animals on this farm are feed organic; GMO-free feed to the best of our ability and our feed mills ability. During pollination, GMO from neighbor’s fields could contaminate our fields but we provide tree line, brush and a 25’ buffer between our conventional neighbors. Most of our land we own and rent is surrounded by woods so no GMO, insecticides or herbicides even gets close. What’s the difference between your beef and grassfed beef? Our animals are raised on grass during the growing season, but we feed corn silage to the cows and steers when we have it available, mostly in the winter-spring time period to help the animal maintain healthy body weight during the cold months. We feed the milking cows less than 10 lbs. of a day of barley, corn and minerals to get them to take a stall in the barn and to maintain a healthy and productive body weight during the months they are milking. Grassfed beef can be feed grain at a young age but then no grain during the rest of their life which takes an animal more time to grow, which cost the farmer more to get them to butchering size which produces a very lean meat. I do if I have to, it is in the organic rules if you have an animal that is suffering and other ways or treatment doesn’t work, that it is our duty to give the animal a pill or shot of antibiotic medicine to try to save its life. These animals cannot be sold as organic butcher animals or used as an organic dairy cow for milk or butchering. They can however be sold to a conventional farm or butcher after the recommended withhold time is carried out. Why do you have milk replacer? Occasionally I will raise groups of bull calves (mostly Holsteins) for friends, family and neighbors that don’t enjoy raising their own. I rather not use my organic milk from the tank because it worth more selling it than feeding bull calves. I keep conventional bull calves separate from organic calves to feed them with the appropriate milk if milk replacer is used.